At Grace Academy of Dance & Performing Arts, we believe learning to dance is so much more than simply practicing steps and movements. It’s also an opportunity to develop confidence, grace and poise that will last a lifetime. Our instructors are dedicated to creating a supportive environment in which students gain a strong technical foundation and natural love of movement and creativity. Our focus on individual growth and achievement ensures students recognize their accomplishments and take away wonderful memories of their experience. 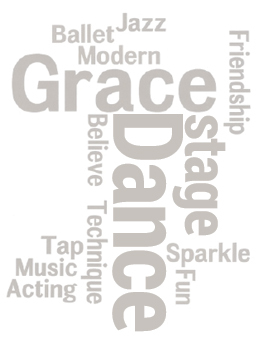 Grace Academy offers classes in classical ballet, modern theatre dance, jazz, tap, hip hop, musical theatre, and acting. We provide students with the opportunity to explore their creativity in a safe, caring and fun setting, where strong friendships are established as they develop a love of dance! Our studio is centrally located for convenient access from Oakville, Burlington, and Milton. Please visit Our Classes, Schedules or call us for more information about our dance and theatre classes.